You are here: Home » MS + Google » Microsoft » “Leaked” Microsoft Retail Store Concept Sketch! 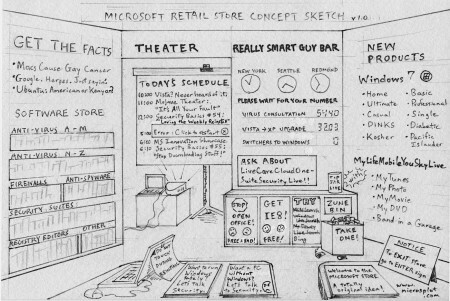 Humorous concept sketch of Microsoft retail store reveals the unspoken Microsoft plan, including details of their App Store software selections, theater presentations, and really smart guy bar! All the stuff they copied from the Apple Store, with the Microsoft touch. It even shows the Microsoft focus on security! 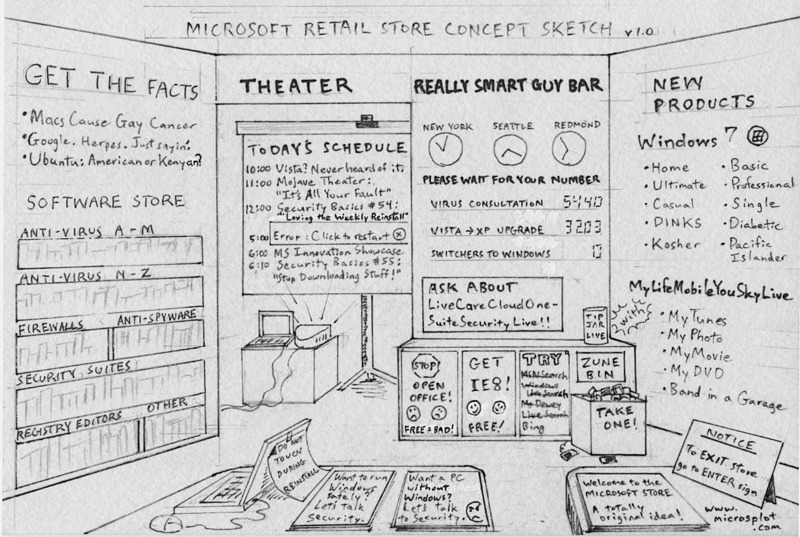 Forget about MS Store copying the Apple Retail Store, as there is no Apple Genius Bar anywhere in the concept sketch. Looks like Microsoft actually thought of everything for once! They even scheduled a 10 minute presentation on Microsoft Innovation! A huge win for Microsplot, and great summary of Microsoft fails. This entry was posted on Tuesday, January 5th, 2010 at 6:59 pm	and is filed under Microsoft. You can follow any responses to this entry through the RSS 2.0 feed.